"Liers" redirects here. For the Spanish parish, see Lieres. 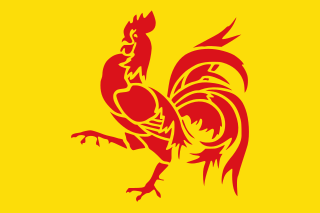 For the French commune, see Lières. For people who lie, see Lie. Herstal, formerly known as Heristal, or Héristal, is a municipality of Belgium. It lies in the country's Walloon Region and Province of Liège along the Meuse river. Herstal is included in the "Greater Liège" agglomeration, which counts about 600,000 inhabitants. Herstal municipality includes the former communes of Milmort, Vottem, and Liers (partly, the other part being incorporated into Juprelle). A large armaments factory, the Fabrique Nationale or FN, and the biggest industrial zone of Wallonia (Haut-Sart) provide employment locally. 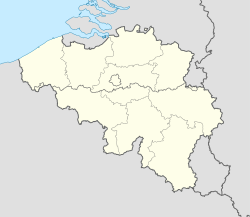 Vottem is a town in the Belgian province of Liège, with a population of 38,750. It is near Rocourt, Liers, and Milmort, and lies in the municipality of Herstal. 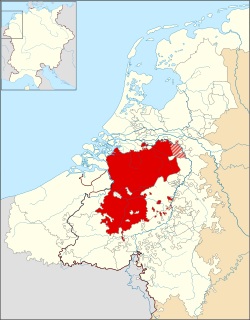 Juprelle is a municipality of Belgium. It lies in the country's Walloon Region and Province of Liege. On 1 January 2006 Juprelle had a total resident population of 8,405. The total area is 35.36 km² which gives a population density of 238 inhabitants per km². The proximity of the Meuse River and the abundance of local resources attracted settlers in this area since the fifth millennium BC. Around the end of the Roman era and at the beginning of the Merovingian period, the hamlet had become a fortified stronghold. The major road that linked Tongeren to Aachen crossed the Meuse here, where a ferry likely carried travelers to Jupille. Pippin of Herstal (ca 635–714), Mayor of the Palace and de facto ruler of Austrasia and Neustria and founder of the family that established the Carolingian dynasty, probably chose this location as his main residence because of its proximity to the major cities of Tongeren, Maastricht, and Liège. Pippin was the father of Charles Martel, victor of the decisive Battle of Tours that stopped the Arab-Muslim advance into northwestern Europe, and grandfather of Charlemagne, also supposedly born in Herstal. Charlemagne lived for at least fifteen years in Herstal but later established his capital in Aachen, ending Herstal’s period of medieval glory as capital of the empire. Under the Merovingian dynasty, the mayor of the palace or majordomo was the manager of the household of the Frankish king. The office existed from the sixth century, and during the seventh it evolved into the "power behind the throne" in the northeastern kingdom of Austrasia. 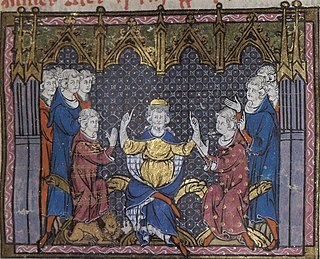 In 751, the mayor of the palace, Pepin the Short, orchestrated the deposition of the king, Childeric III, and was crowned in his place. The town was incorporated into the Duchy of Lower Lotharingia, which became part of the Duchy of Brabant at the end of the 12th century. Despite its proximity to Liège, the territory of Herstal did not become part of the Bishopric of Liège until 1740, date at which the prince-bishop Georges-Louis de Berghes bought it from Frederick II of Prussia. By that time, the town was mainly known for its able craftsmen: ceramists, blacksmiths, and clockmakers. In the 19th century, Herstal became a city of coal and steel. It would, however, become world-famous thanks to the foundation of the Fabrique Nationale, a major armament factory, in 1889. Several motorcycle manufacturers also established themselves in town. On August 7, 1914, at the very beginning of World War I, the invading German army executed 27 civilians and destroyed 10 homes in Herstal. After World War II, heavy industry saw a prolonged period of decline, drastically reducing the number of jobs in these areas. Today, Herstal’s economy is picking up again, with more than 200 companies established on its territory, including Techspace, which manufactures precision parts for the European Space Agency’s Ariane rocket. A museum, housed in a 1664 building typical of the region, shows various artifacts of the Prehistoric and Gallo-Roman periods, a Frankish burial place, and several displays retracing the history of the Pippinid dynasty that originated here. The museum also has a collection of local industrial products, including samples from the FN. The Pippin Tower incorporates a wall section thought to have belonged to the palace of Charlemagne. Chilperic II, known as Daniel prior to his coronation, was the youngest son of Childeric II and his half-cousin, king of Neustria from 715 and sole king of the Franks from 718 until his death. Ansegisel was the younger son of Saint Arnulf, bishop of Metz. He served King Sigebert III of Austrasia (634–656) as a duke and domesticus. He was killed sometime before 679, slain in a feud by his enemy Gundewin. Through his son Pepin, Ansegisel's descendants would eventually become Frankish kings and rule over the Carolingian Empire. Theuderic III (c.651–691) was the king of Neustria on two occasions and king of Austrasia from 679 to his death in 691. Thus, he was the king of all the Franks from 679. The son of Clovis II and Balthild, he has been described as a puppet – a roi fainéant – of Ebroin, the Mayor of the Palace, who may have even appointed him without the support of the nobles. He succeeded his brother Clotaire III in Neustria in 673, but Childeric II of Austrasia displaced him soon thereafter until he died in 675 and Theuderic retook his throne. When Dagobert II died in 679, he received Austrasia as well and became king of the whole Frankish realm. Saint Lambert was the bishop of Maastricht-Liège (Tongeren) from about 670 until his death. Lambert denounced Pepin's liaison with his mistress Alpaida, the mother of Charles Martel. The bishop was murdered during the political turmoil that developed when various families fought for influence as the Merovingian dynasty gave way to the Carolingians. He is considered a martyr for his defence of marriage. His feast day is September 17. The Pippinids or Arnulfings are the members of a family of Frankish nobles in the Pippinid dynasty. Their selections served as Mayor of the Palace, de facto rulers, of the Frankish kingdoms of Neustria and Austrasia that were nominally ruled by the Merovingians. Dagobert III (c.699–715) was Merovingian king of the Franks (711–715). Chlothar IV was the king of Austrasia from 717 until his death. He was a member of the Merovingian dynasty, and was installed by Charles Martel, a candidate for the office of mayor of the palace, in opposition to Chilperic II, whose realm was thus reduced to Neustria. This marks the first time since 679 that the kingdom of the Franks was divided. Following Chlothar's death, it was reunited under Chilperic. The Battle of Compiègne was fought on 26 September 715 and was the first definite battle of the civil war which followed the death of Pepin of Heristal, Duke of the Franks, on 16 December 714. Grimoald II, called the Younger, was the mayor of the palace of Neustria from 695. He was the second son of Pepin of Herstal and Plectrude and his father placed him in the office of mayor of the palace in the Neustrian kingdom in 695, when he was still young. Theudoald was the mayor of the palace, briefly unopposed in 714 after the death of his grandfather, Pepin of Herstal. Then in 715 the nobility acclaimed Ragenfrid mayor of Neustria and Charles Martel mayor of Austrasia. Plectrude was the consort of Pepin of Herstal, the mayor of the palace and duke of the Franks, from about 670. She was the daughter of Hugobert, seneschal of Clovis IV, and Irmina of Oeren. She was the regent of Neustria during the minority of her grandson Theudoald from 714 until 718. 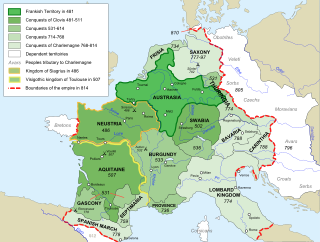 The Battle of Tertry was an important engagement in Merovingian Gaul between the forces of Austrasia on one side and those of Neustria and Burgundy on the other. It took place in 687 at Tertry, Somme. 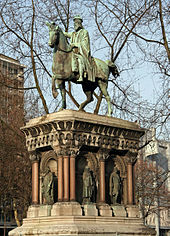 The Battle of Cologne was fought near the city of Köln in the year 716. The battle is known chiefly as the first battle of Charles Martel's command and is the only defeat of his life. Quierzy is a commune in the Aisne department in Hauts-de-France in northern France, straddling the Oise River between Noyon and Chauny. ↑ Maurits Gysseling, Herstal in the Toponymical Dictionary of Belgium, the Netherlands, Luxembourg, Northern France and West Germany (before 1226). ↑ OVH. "Félicitations ! Votre domaine a bien été créé chez OVH !". ↑ "ECOLO - Ecolo - Groupe local de Liège".